I ran Mind the Ducks after a week spent in NYC at a barefoot running coaching class where I stuffed my mind with new ideas and perspectives and doing a huge amount of walking around NYC. So I came into this race tired and with very low expectations of myself. 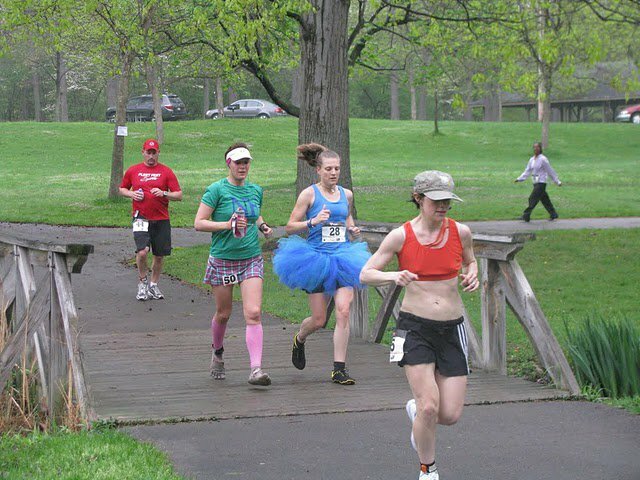 To make up for it I wore a tutu with some friends! As soon as I decided that I was going make my VIVOBAREFOOT coaching class the priority of my travels, Mind the Ducks miles were put on the back burner and I anticipated only being able to do 15 or so miles since that is the longest run I had done prior. I had some higher mileage weeks but didn't think I was ready for anything more than that. Shacky and Vanessa (both online friends that I was so lucky to meet in person) picked me up the night before at the train station. The recliner in the hotel room was fabulous and I slept like a baby. We arrived at the race start a tad bit late having programed the wrong address into the GPS. Despite the blue tutu, (Shacky and Vanessa both wore tutus as well. Vanessa wore hers the whole race!) I couldn't seem to get my groove on. Clothing changes and bathroom issues made for a rough start to the race. I didn't run with music however Shelley Viggiano, the race director, had an excellent playlist. When I was feeling really down I came around the corner to the headquarters tent and Florence and the Machine's Dog Days are Over came on and I was stoked for the rest of the race. It was exactly the song to hear at that moment. Funny how that happens sometimes. What is Mind the Ducks you might ask....its a 12 hour timed race where you put in as many miles as you can and or want to in 12 hours. Its a half mile loop around the most lovely tree lined, duck infested lake. Some think that a looped course is boring and monotonous. I thought this loop was perfect. It was the right distance that you could always convince yourself to go around just one more time. 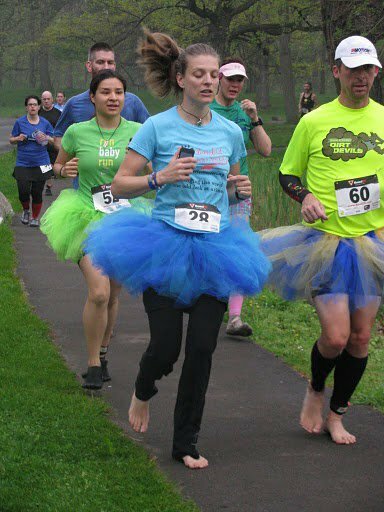 I started the race barefoot and after about 4 miles I conceded that if I wanted to put in more than 10 or so miles I would have to put on some shoes. The path was just too rough. I decided to gamble and try the VIVOBAREFOOT Neos for the remainder of the miles and they worked beautifully. A proper review will be written later. This shoe was yet another pleasant surprise for the day in that wearing a brand new pair of shoes for 32 miles is not always a really bad idea! keeping up with Jesse Scott and Mark Robillard for a while was tough but it really seemed to work out any kinks I had. Another surprise of the day, faster is sometimes easier. I took her advice and again was surprised at how walking was better than sitting yet running was better than walking. Not long before I decide to get up and go I heard The Cave by Mumford and Sons and it made me think of Kitty who was not able to come to the race because she decided to spend the money on an iPad for her son with autism. I have a special bond with her since we both have fellas with autism and I would have done the same thing in a heart beat. After I heard that song, I got up and ran another 6 miles and some change with a smile on my face. Before the last lap, I slowed down and stopped and looked at the clock right wrestling with the idea of having enough time to squeeze in one more lap. Others were finishing and congratulating each other. As I debated I looked at Shelly Robillard and she smiled and said "go, you have time, go". (thank you Shelly) So I did and I ran as fast as I could make myself without hurling. I was the last to come in at 11:59:43. That last loop was one of the best for me. It made 38.89 miles! I didn't know I had that in me. Any of it. Now I do and again my perspective has changed. Recovery was a breeze. At the after party/ awards dinner The Robillards and Shelley V were telling me what to expect in recovery and what was normal. I was thinking that I would have to contend with painful swelling, bloating, and mild fever and yet I slept again like a baby after taking three ibuprofen and only had minor swelling in my feet and a good kind of soreness that comes from doing work. I hung out with the Viggiano's the next day and then caught my train that would take me home. My heart ached for my soul mate and my spawn and I was ready to be home. 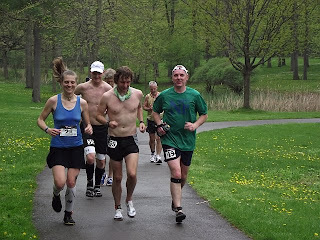 ~The above links are those of fellow runners recaps. ~Mind the Ducks results and links for a huge amount of photos!! ~I ate Salt Potatoes which are a Rochester Specialty. Basically little white potatoes boiled in salt water although one would think there is some magic in the mix. I also ate blue corn tortilla chips, apple sauce and chia seeds, gummy worms, gummy bears, sweedish fish, turkey deli meat, a little hummus and lot and lots of Strawberry Lemonade nuun! VIVOBAREFOOT COACHING CREW......I think my form changed.....accept for that really tired bit at the end! Great job, my friend!!! It was awesome to meet you on your way up. Know that you always have a place to crash in the DC area! Awesome job! What a cool event to be a part of. Can't wait to hear how the week of training went also. I second MCM's response...great to meet you and if you pass through again, you have a place! You inspire me! Awesome mileage for that race!! Congrats! Can't wait to talk to you about it. In my currently uncertified opinion, I agree with your assessment that your form did change except for that bit at the end. Incredible mileage for a new running form, too. Angie, Thanks for running for me. Reading that bit of your post actually made me a little teary; not in a bad way. I suppose I was just a little more proud of your achievement. Way to go. One day we will run together. Promise! Congratulations Mate - fantastic run. I knew you could do it. This race looks like a great event with fantastic people. It's amazing that you put in that many miles. Very inspiring. I hope you recover quickly. That is such a cool race. And you are AMAZING! Being able to push yourself like that at the end and finish with almost 39 miles is incredible. That race will be a tough one to follow. Wow, I can't even imagine being on my feet running and walking for that long! You are awesome... congrats! You rock, girl! I was so proud watching you push your limits! I'm glad your recovery went so well too. Mine was fine this year but last year I was more of a train wreck so I hope I didn't scare you. Way to go girl. It sound like you had an awesome time. It looked like it would be fun to do. Congrats on all those miles you got in. Loved the tutu. Great run, well done! I absolutely love circuit races. That's what we call them here in South Africa. I've done 12 hour, 24 hour, 48 hour and 6 day circuit races. I've got some planned in the next few years as well. What a great event. I thought about Katie too and it made me smile to think of mother's sacrificing all they can for their children. How great to meet the Robillards. What a perfect end to a great week. I sure wish that I could attend one of your clinics. I need to work on downhill form. Do you have any tips for me? I ran a marathon this last weekend and followed your fueling tips. It worked like a charm as did the Nuun. I am officially a Nuun snob. Great job! What a fun experience. How cool that you were there. One of my friends from grad school ran it with his wife. On the video they show up at 1:54 - 2:01. :) I'm glad your recovery went well! Wow!! Great job! Sounds like a lot of fun too! Angie this sounded amazing! I love your effort. I love your tutu. I love how you surprised yourself. Friends are wonderful. All I can say is "Wow!" I love everything about this. Those shoes look great (even though I'm still refusing to put on any shoes -- and don't yet have to -- but know that I'll have to pick some out some time.) I'll be looking for the longer review. This whole post put a longing in me, but a longing for something I'm so far away from. I'm going to think about you running round and round and your statement "I didn't know I had that in me. Any of it." when I go through my black sash test on June 10th. I'm with mamarunsbarefoot! What an awesome accomplishment and would love to meet you in person some day! Love that video. You looked so strong coming through the finish line. You rocked the FIYAH, girl!!! !